This Fairfax online interview with Momofuku’s innovative founder/chef David Chang has many insights into creativity, that don’t just apply to the kitchen. “We have so much information available to us, it’s almost too much”. “Look at everything like a crayon box…start with the basic 5 colours of the rainbow, It’s easier to learn to create (or cook) with anything, it’s more difficult to limit yourself, put blinders on and focus on the basics”. “Learn to walk before you can run”. “The good ideas have all been done before, all you can do is do it a little better”. “It’s important to know the history, where you influences have come from, if you’re not moored in the past you’re just going to spin off the planet”. 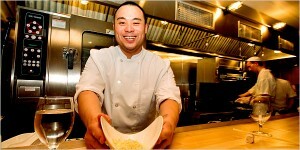 David Chang takeaways: Start small. Learn the basics. Master using only a few resources well. When you’ve nailed them, add a few more. If you liked this article ,tweet it!.